We found out the name of the building where the Ku Klux Klan published their newspaper, The Liberator, in the 1930s. In the last episode, we investigated Rebecca Jade’s question about whether a plaque could go up where the Liberator was published. At the time, we weren’t able to pin down what the name of the building where the KKK and the Liberator had offices. The address was 10105 – 100 St.
After the episode went up, I posted it to a Facebook group called Historic Edmonton and Northern Alberta. 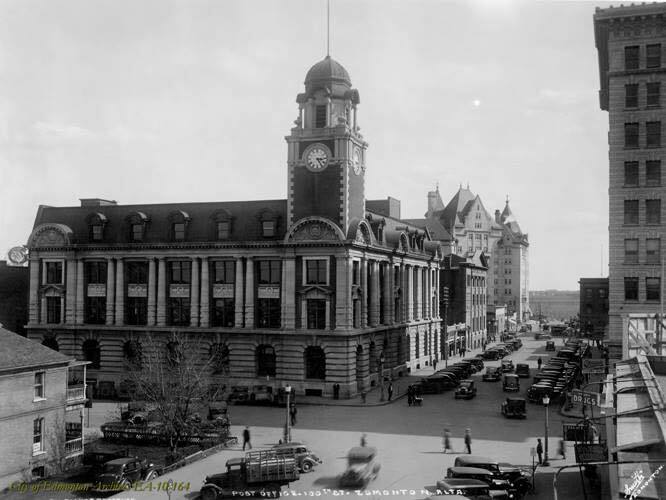 Dawn Valentine found this picture of the Old Post Office, which seemed to show the mystery building in the background, in front of the Hotel Macdonald. 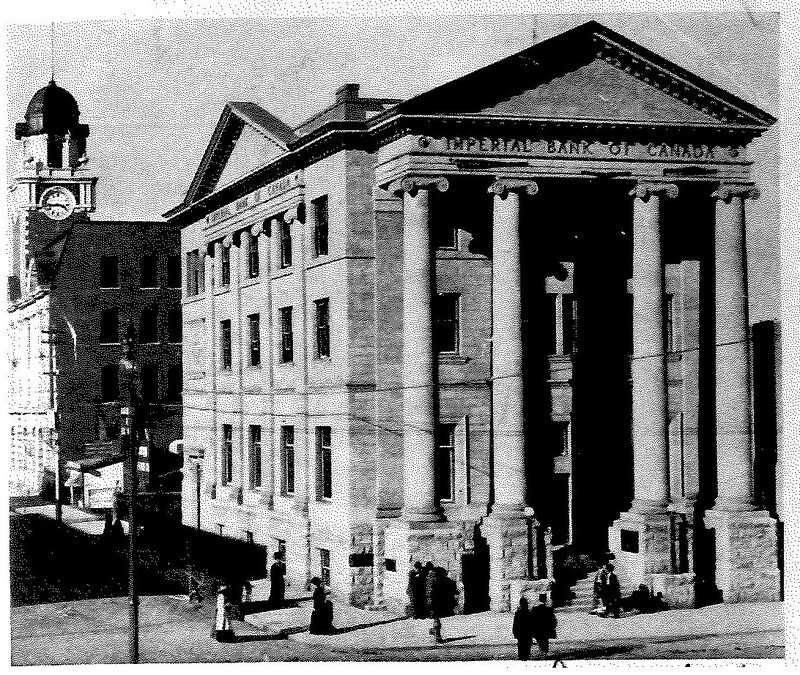 Brent Welch, from the same group, found this picture from a different angle, which shows that the building was part of the Imperial Bank of Canada. He also found that the Henderon’s Directory for 1933 names 10105 – 100 St as the Imperial Bank Chambers. It appears to have had a separate address from the main building because it had a separate entrance facing 100 St. 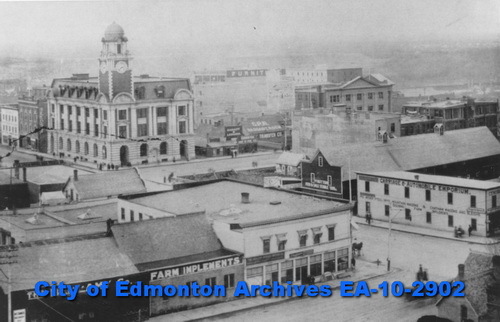 This is another picture of that same block from 1912, looking South East this time. 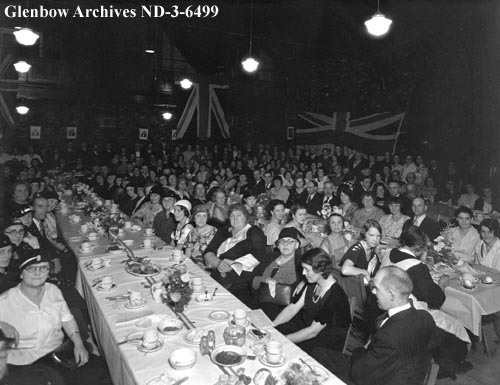 And this is the photo mentioned in the podcast, of JJ Maloney’s 1933 farewell dinner at the Hotel Macdonald, when he announced he was leaving Edmonton. Great find Jade! Yet, I’m not surprised considering the history of this city and many uncultured peoples, scattered around our cities and towns, across the prairies and beyond. I’m aware of the same kind of rhetoric that goes on today,in our communities throughout Alberta. Shameful and unforgiving. What’s even more humiliating, on a personal note, I’m a protestant from a British/Scottish(Clan) background! My grandfather homesteaded in the Grande Prairie region. I know, there have been negative comments in my family, when I was younger, from my grandparents, concerning immigrants homesteading in the same region, from Ukraine, Poland, Germany. I hope you post your article for all to see our shameful past, so yes, this kind of racism doesn’t raise it’s ugly head, especially during these tough economic times. Especially with what is happening currently, which is exactly what the >l >l >l (backward spelling) for a backward racist evil, fueling their cause.